Vermicomposting. Image Credit: Rua Lupa. Whatever comes from Nature is of Nature, no matter its form or its location. Nothing is separate from Nature. In knowing this we as Saegoahs choose to ensure our connections within Nature are harmonious and encourage life, instead of ignoring the workings of Nature and inadvertently cause disharmony. 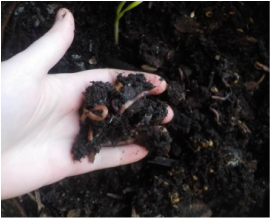 One such thing that can be done is vermicomposting (learn how you can do that here) and from vermicomposting comes an inoculate – a liquid fertilizer chock full of micro-organisms that are beneficial to a soil ecosystem. We can take this vermicomposting resource and put it to good use by providing it to the land. Either feeding it to our own gardens that we directly reap the benefits from, or we can make it a libation – a sacrificial offering that we personally don’t directly benefit from. This can be done by way of going to land that you don’t personally own and pouring these libations there. Or, you can set aside land that within our societal legal system you do own, but have made it to be its own place – being sanctified as land that belongs to itself. This can be of any size, be it a square meter (square yard) or hundreds of acres. This land grows in its own way, and it can be cared for in a way that benefits it further. It can be offered native seeds in compost and libations of inoculate to promote life. Such a place can be considered a sacred grove for ritual and ceremony that you, or your group, are dedicated to (to learn how you can establish a self-sustaining forest for this purpose go here). Chalice In The Trees. Image Credit: Rua Lupa. “In gathering what has been left from my toils in sustaining myself, and with the workings between species that share this land, this enriched liquid was cultivated. Instead of keeping this enriched liquid for my personal gain, I offer it here, to this land so that this land may itself be enriched for its own benefit, and through it may all others of this land prosper.